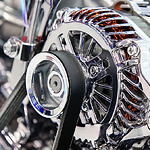 How Does an Alternator Help Your Vehicle Function? Your vehicle comes equipped with a number of components that help if function, which include an alternator, but what is an alternator? An alternator is an important piece of equipment that should be free of damage to ensure that your vehicle doesn't suddenly shut down. We welcome you to read our content below for additional information about your vehicle's alternator. You vehicle includes a starting system that is comprised of three primary components, which include the battery, starter, and alternator. An alternator acts as a generator and keeps the battery charged while you are driving, but it also helps the battery keep the electrical components in your vehicle working properly. Signs of a faulty alternator include a shrieking sound coming from the engine, the smell of burning rubber, or dim lighting. Do you think that your alternator needs to be inspected? If so, visit our service center at Cox Auto Group.